Protect your investment. From Patio Heaters to Fire Pits, Paramount Vinyl Covers have you covered! These water resistant vinyl covers offer protection from the elements. For longest life, it is recommended to always store your outdoor heating units in a shed or garage during winter months when the units are not in use as some parts are more susceptible to damage due to extreme cold. Constructed of heavy 10 gauge, felt lined vinyl. Fabric ties for secure fit. Get protection for your firewood from rain, snow, mold and insects with our tough built galvanized steel Arrow Firewood Rack. Conveniently made to fit virtually anywhere, it's the perfect firewood storage structure that fits beneath decks, on your patio or in mudrooms. Its pent roof eliminates water from accumulating on the top of your storage structure, keeping firewood dry and ripe for kindling. Its open front and back allow for adequate airflow, allowing your firewood to be well ventilated at all times during storage. Stores 1/8 cord of wood. Anthracite color with onyx trim. The round Desert Stream LavaGlass instantly adds a touch of elegance to any outdoor heating appliance. Whether you're wanting to add a pop of color, or simply match with your existing patio dicor, this fire glass is your go-to. The Desert Stream LavaGlass. combines a dry copper with refreshingly crystal-clear glass, for true balance. One bottle of LavaGlass will cover up to two square feet and the base layer of your unit should be built up of small lava rock to ensure the flame stays oxygenated for optimal heat. 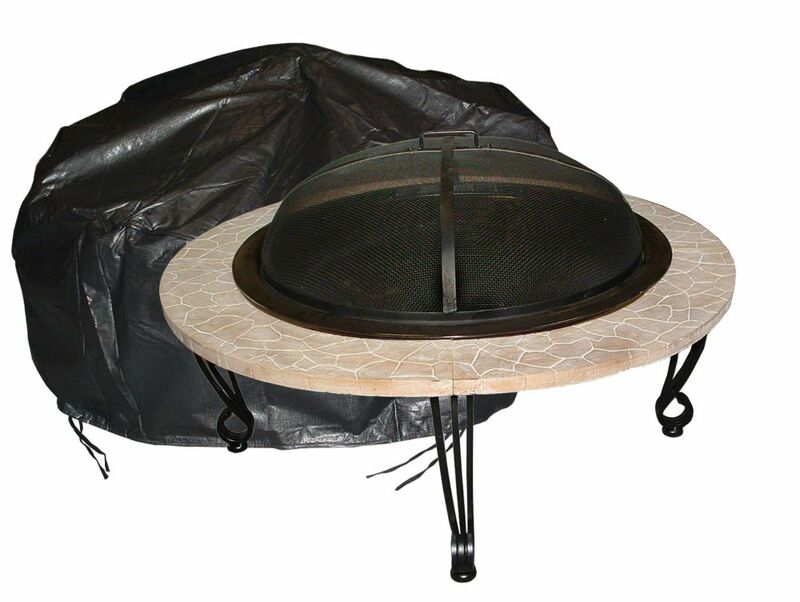 Outdoor Vinyl Round Fire Pit Cover Protect your investment. From Patio Heaters to Fire Pits, Paramount Vinyl Covers have you covered! These water resistant vinyl covers offer protection from the elements. For longest life, it is recommended to always store your outdoor heating units in a shed or garage during winter months when the units are not in use as some parts are more susceptible to damage due to extreme cold. Outdoor Vinyl Round Fire Pit Cover is rated 5.0 out of 5 by 1. Rated 5 out of 5 by RJ52 from Great value for price. It was light enough to handle easily, yet thick enough to protect our portable fire pit. Great value for the price.